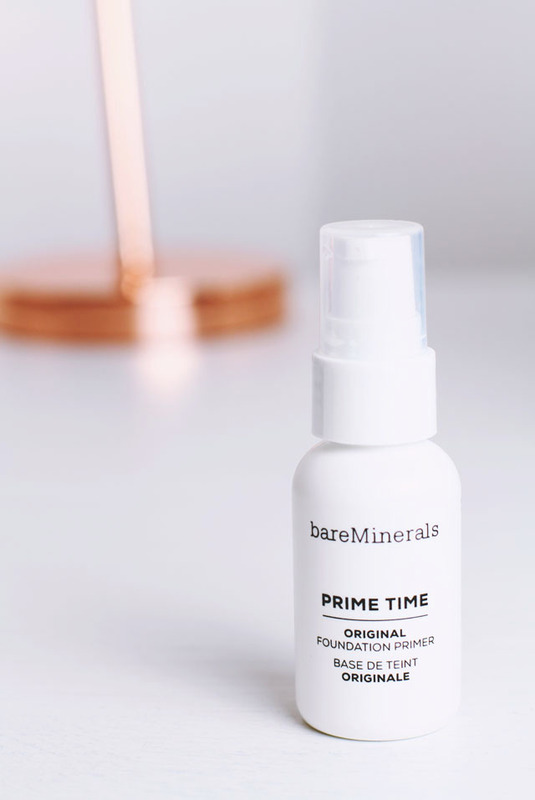 Months ago, when I was looking for a suitable primer for my dry skin, one of the recommendations- aside from Smashbox and Laura Mercier- was Bare Minerals Prime Time. I asked Twitter to vote on which one I should get and Bare Minerals came out bottom so I forgot about it and moved on. Since I've tried both of the others, and wasn't particularly overwhelmed by either, I decided to give this one a shot. Turns out, it's the best of the lot! This primer comes inside a small 30ml bottle with a pump dispenser. I much prefer this to the tubes of most other primers since, although it's not as "squidgy", it is more compact and I find that much easier to squeeze into my make up bag. It also feels secure- no risk of leaking or ending up with a puncture. As I mentioned, the bottle operates with a pump so the primer is easily dispensed. When it is released, it's revealed to be a clear, jelly-like substance and two pumps is the perfect amount to cover my face in a thin, even layer. This is where it really swayed me- as I apply the primer, it glides across the skin, creating an exceptionally smooth finish. In fact, I'd say it is pretty much identical to the application of The Porefessional, which I loved so much before I realised it was destroying my skin! Once it has been applied, it is quickly absorbed, leaving the perfect base for my foundation. Using Prime Time primer has made a huge difference to my skin. Although it feels like The Porefessional on application, it differs in the way that it's hydrating and gives my skin a more radiant appearance. Because it's so smooth, my foundation applies smoothly on top with absolutely no clinging to dry patches which is quite a feat since I use this NARS foundation which is notorious for accentuating dry skin. Not only that, my skin has felt softer and more refreshed even on days when I'm not wearing it. Between this and the oil-infused micellar water I've been using, I think I've finally defeated my dehydrated skin! I'm so impressed with this primer that I can't imagine myself wanting to try a new one. It feels like I'm slowly building up my Holy Grail products- first my eyeliner, then my concealer and now, finally, my primer. Just goes to show- Twitter doesn't have all the answers! Can't believe this came bottom and was the best - proof is always in the pudding!